Introduction. Upland swamps are under increasing pressure from anthropogenic activities, including catchment urbanization, longwall mining, and recreational activities, all under the omnipresent influence of global climate change. The effective management of upland swamps, and the prioritisation of swamps for conservation and restoration requires a robust means of assessing ecosystem health. In this project we are developing a range of ecological and geomorphic indicators and benchmarks of condition specifically for THPSS. Based on a multi-metric approach to ecosystem health assessment, these multiple indicators and benchmarks will be integrated into an ultimate index that reflects the health of the swamp. In this project we have adopted (and modified) the definition of ecosystem health applied to groundwater ecosystems by Korbel & Hose (2011). We define ecosystem health of a swamp as, i.e., “an expression of a swamp’s ability to sustain its ecological functioning (vigour and resilience) in accordance with its organisation while maintaining the provision of ecosystem goods and services”. Design. Our approach to develop indicators of swamp health followed those used to develop multimetric indices of river and groundwater ecosystem health (e.g. Korbel & Hose 2011). We used the ‘reference condition’ approach in which a number of un- or minimally disturbed swamps were sampled and the variation in the metric or index then represents the range of acceptable conditions (Bailey et al. 1998; Brierley & Fryirs 2005). We focused initially on swamps in the Blue Mountains area. Reference (nominally unimpacted) and test sites with various degrees and types of impacts were identified using the database developed by the concurrent THPSS mapping project (Fryirs and Hose, this volume). Following our definition of ecosystem health, we selected a broad suite of indicators that reflect the ecosystem structure (biotic composition and geomorphic structure) and function, including those relating to ecosystem services such as microbially-mediated biogeochemical functions, geomorphic processes and hydrological function, as well as the presence of stressors, such as catchment changes. Piezometers and dataloggers have been installed in a number of swamps to provide continuous data on groundwater level fluctuations and sediment cores taken at the time of piezometer installation have provided detailed information on the sedimentary structure, function and condition of the swamps. Results. Intact and channelised swamps represent two geomorphic condition states for THPSS. Not surprisingly, variables reflecting the degree of catchment disturbance (such as urbanization) were strongly correlated with degraded swamp condition. Variables related to the intrinsic properties of swamps had little relationship to their geomorphic condition (Fryirs et al. 2016). Intact and channelized swamps present with typically different sediment structures. There were significant differences in the texture and thickness of sedimentary layers, C: N ratios and gravimetric moisture content between intact swamps and channelised swamps (Friedman & Fryirs 2015). The presence and thickness of a layer of contemporary sand in almost all channelised swamps and its absence in almost all intact swamps is a distinctive structural difference. 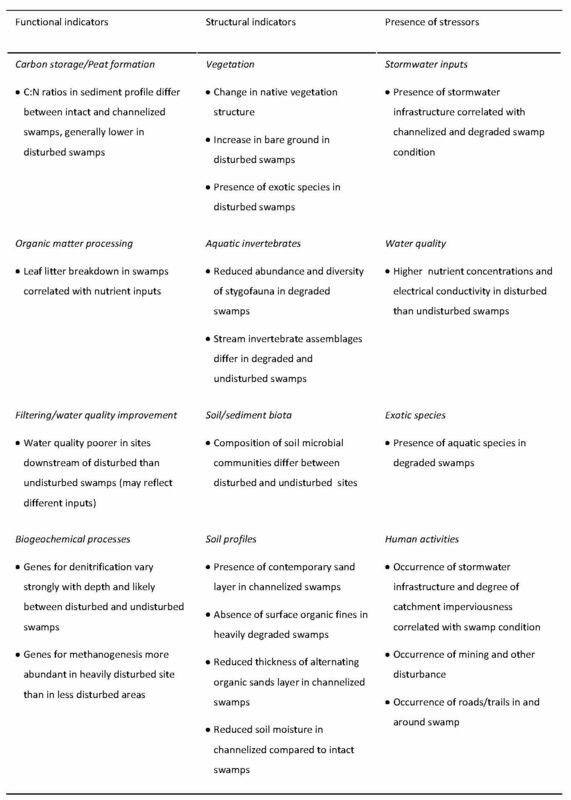 Disturbed swamps have poorer water quality at their downstream end, and associated with this, lower rates of organic matter processing occurring within the streams (Hardwick unpublished PhD Data). Similarly, the richness and abundance of aquatic invertebrates living within swamp sediments (stygofauna) is poorer in heavily disturbed swamps than in undisturbed or minimally disturbed areas (Hose unpublished data). Within the swamp sediments, important biogeochemical processes, such as denitrification and methanogenesis, are undertaken by bacteria. In this study we are measuring the abundance of the functional genes such as a surrogate for functional activity within the swamp sediments. There is large spatial variation in the abundance of functional genes even within a swamp, which complicates comparisons between swamps. Within our focus swamp, the location closest to large stormwater outlets had different functional gene abundances, in particular more methanogens, than in less disturbed areas of the swamp. There were greater abundances of denitrification genes, nirS and nosZ, in shallower depths despite denitrification being an anoxic process, which may reflect changes in the surficial sediments due to disturbance. Overall however, the abundance of functional genes seem to vary more with depth than with location, which means that comparisons between swamps must ensure consistency of depth when sampling sediments (Christiansen, unpublished PhD data). The list of indicators currently being tested in this project and by others in this program (Table 1) will be refined and incorporated into the final assessment framework. Thresholds for these indicators will be determined based on the range of conditions observed at the reference sites. The overall site health metric will reflect the proportion of indicators which pass with respect to the defined threshold criteria. At this stage, the final metrics will be treated equally, but appropriate weightings of specific metrics within the final assessment will be explored through further stakeholder consultation. Stakeholders and Funding bodies. This research has been undertaken as PhD research projects of Kirsten Cowley, Lorraine Hardwick and Nicole Christiansen at Macquarie University. The research was funded through the Temperate Highland Peat Swamps on Sandstone Research Program (THPSS Research Program). This Program was funded through an enforceable undertaking as per section 486A of the Environment Protection and Biodiversity Conservation Act 1999 between the Minister for the Environment, Springvale Coal Pty Ltd and Centennial Angus Place Pty Ltd. Further information on the enforceable undertaking and the terms of the THPSS Research Program can be found at www.environment.gov.au/news/2011/10/21/centennial-coal-fund-145-million-research-program. This project was also partly funded by an ARC Linkage Grant (LP130100120) and a Macquarie University Research and Development Grant (MQRDG) awarded to A/Prof. Kirstie Fryirs and A/Prof. Grant Hose at Macquarie University. We also thank David Keith, Alan Lane, Michael Hensen, Marcus Schnell, Trevor Delves and Tim Green. Contact information. A/Prof. Grant Hose, Department of Biological Sciences, Macquarie University (North Ryde, NSW 2109; +61298508367; grant.hose@mq.edu.au); and A/Prof. Kirstie Fryirs, Department of Environmental Sciences, Macquarie University (North Ryde, NSW 2109; +61298508367; kirstie.fryirs@mq.edu.au). Table 1. List of indicators of swamp condition that are being trialled for inclusion in the swamp health assesment toolbox. Introduction. Swamps are an ideal natural archive of climatic, environmental and anthropogenic change. Microbes and plants that once inhabited the swamps are transformed and accumulate in undisturbed anoxic sediments as (sub)fossils and become useful proxies of the past environment. Since these systems are intrinsically related to hydrology, the reconstruction of past moisture availability in swamps allows examination of many influences, including climate variability such as El Nino-induced drought. It can also provide baseline information: long (palaeoenvironmental) records can reveal natural variability, allow consideration of how these ecosystems have responded to past events and provide targets for their restoration after anthropogenic disturbance. Testate amoebae are a group of unicellular protists that are ubiquitous in aquatic and moist environments. The ‘tests’ (shells) of testate amoebae preserve well and are relatively abundant in organic-rich detritus. Testate amoebae are also sensitive to, and respond quickly to, environmental changes as the reproduction rate is as short as 3-4 days. Modern calibration sets have demonstrated that the community composition of testate ameobae is strongly correlated to moisture (e.g. depth to water table and soil moisture) and this allows statistical relationships to be derived. These relationships have been used extensively in European research for the derivation of quantitative estimates of past depth to water table and hence moisture availability. Although a suite of different proxies have used to reconstruct aspects of past moisture availability in Australia (e.g. pollen, diatoms, phytoliths) very little work on testate amoebae has occurred to date. This project aims to address this deficiency by examining testate amoebae in several ecologically important mires in eastern Australia including Temperate Highland Peat Swamps on Sandstone (THPSS), an Endangered Ecological Community listed under the Environment Protection and Biodiversity Conservation Act 1999 and as a Vulnerable Ecological Community under the NSW Threatened Species Conservation Act 1995. The project specifically aims to develop a transfer function linking modern samples to depth to water table in THPSS and to then apply this to reconstruct palaeohydrology over the last several thousand years. Our ultimate aims are to use this research to consider the nature and drivers of past climate change and variability and to also address issues associated with recent human impacts. The analysis of testate amoebae will allow us to consider changes in THPSS state, accumulation and stability over centuries-to-millennia, and this will provide context for recent changes, recommendations for the management of peaty swamps on sandstone and analytic tools for assessing whether remediation is resulting in significant improvement on eroding or drying swamps. Work Undertaken and Results to Date. Research linking testate amoebae and depth to water table in Europe and North America has mostly been undertaken in ombrotrophic (rain-fed) mires. These are distinctly different to THPSS and related communities of the Sydney Basin, which are often controlled by topography (topogeneous mires). In these environments various sediments are known to build up sequentially through time and the minerogenic-rich sediments of the THPSS have resulted in several challenges in our preliminary work. As an example, standard laboratory protocols do not remove mineral particles and these can obscure and make testate amoebae identification difficult. We have since developed a new laboratory protocol and results are promising. We have also been struck by the distinct Northern Hemisphere bias to testate amoebae research: as an example, the Southern Hemisphere endemic species Apodera (Nebela) vas that has been common in our THPSS samples is not included in the most popular guideline book (https://www.qra.org.uk/media/uploads/qra2000_testate.pdf). Despite the new laboratory protocols we have found that testate amoebae are relatively scarce in THPSS environments. 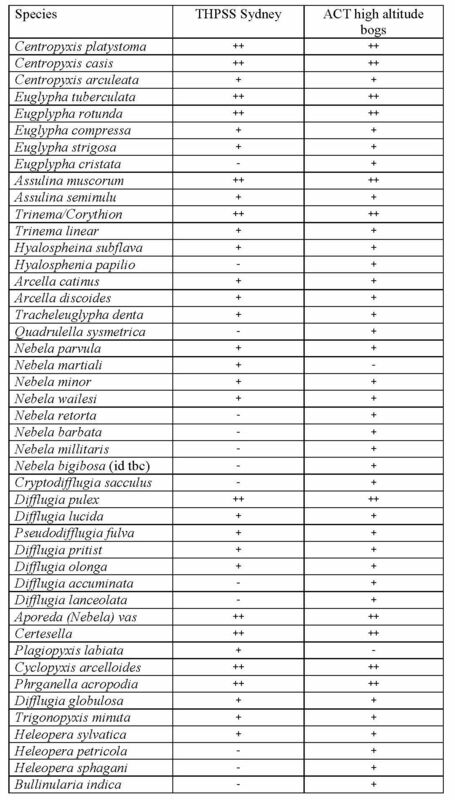 Table 1 outlines the species we are encountering in modern (surface) samples of THPSS and in the high altitude Sphagnum bogs of the Australian Capital Territory: we are finding greater abundance and species richness in the bogs of the ACT. This project commenced in 2015 and will run until 2017. Stakeholders and Funding. This research was funded through the Temperate Highland Peat Swamps on Sandstone Research Program (THPSS Research Program). This Program was funded through an enforceable undertaking as per section 486A of the Environment Protection and Biodiversity Conservation Act 1999 between the Minister for the Environment, Springvale Coal Pty Ltd and Centennial Angus Place Pty Ltd. Further information on the enforceable undertaking and the terms of the THPSS Research Program can be found at www.environment.gov.au/news/2011/10/21/centennial-coal-fund-145-million-research-program. Contact information. The project ‘testate amoebae as indicators of peatland hydrological state’ is jointly being undertaken by: A/Prof Scott Mooney (School of Biological, Earth and Environmental Science, UNSW +61 2 9385 8063, s.mooney@unsw.edu.au), Mr Xianglin Zheng (School of Biological, Earth and Environmental Science, UNSW, +61 2 9385 8063, xianglin.zheng@unsw.edu.au) and Professor Emeritus Geoffrey Hope (Department of Archaeology and Natural History, School of Culture, History, and Language, College of Asia and Pacific, The Australian National University, +61 2 6125 0389 Geoffrey.Hope@anu.edu.au). Introduction. Palaeoecology (i.e. study of past environments using fossils and sediment cores) is often used to provide information regarding past environmental conditions. In comparison to modern ecological research, the expanded temporal perspective of palaeoecology unlocks an understanding of pre-anthropogenic variability and how ecosystems have responded to past disturbance and perturbations, thereby allowing consideration of their resilience to various environmental change. 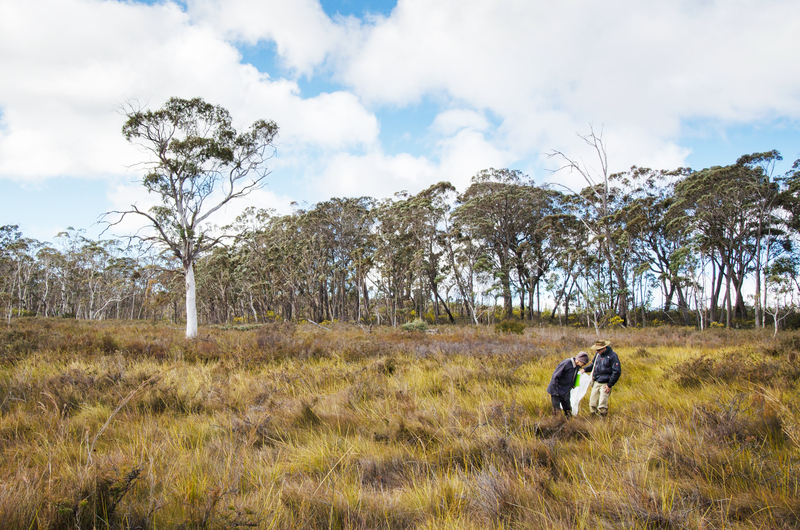 Our Temperate Highland Peat Swamps on Sandstone Research Program (THPSSRP) research has investigated a number of sites in the Blue Mountains and on the Newnes Plateau. Our project aimed to use the sediments accumulating in these sandstone swamps to better understand the dynamics of these ecosystems over time frames that far exceed what is possible through environmental monitoring. We have been documenting the stratigraphy of the sediments using probing and sediment coring/sampling, in association with radiometric (14C, 210Pb) dating, and applying various palaeoenvironmental techniques and proxies to characterize these environments. Our ultimate aims were to characterise recent (historic) trends against the backdrop of a much longer temporal perspective from the palaeoenvironmental analyses and to examine the responses of the swamps over both long (since sediments started accumulating) and short (high-resolution) time frames to disturbance, environmental change and climatic variability. Sydney Basin Meta-study of Accumulating Sediments. The first component of our research involved a meta-analysis of previous data regarding the ages and organic content of sediments in various depositional environments across the Sydney region. Our aim was to consider rates of sediment accumulation in the post-glacial period (the period since the last glacial maximum, about 21,000 years ago): this information informed our subsequent sampling strategies (e.g. depth of coring, resolution of analyses) and can be used in for future research to better target various chronozones. It is probable that rates of sediment accumulation reflect landscape instability/stability and together with organic content, this provides palaeoenvironmental information relevant to the overall aims of this project. For this component we collated and recalibrated radiocarbon dates (n=132) from 44 sites across the Sydney region, and we identified a subset of 12 sites with quantification of the organic content of the accumulating sediments. Findings. The synthesis of these data revealed that sedimentation rates underwent a dramatic increase from ~0.2 mm/yr to ~0.6 mm/yr at the beginning of the Holocene (about ~11,700 years ago), which probably reflects post-glacial climatic amelioration. Sedimentation rates remained relatively high during the Holocene, between 0. 4 and 0. 5 mm/yr, although brief decreases are evident, for example centred at 8200, 6500, 2000 and 1200 calibrated radiocarbon years before present (cal. y BP). Only in the last 400 cal y BP do sedimentation rates increase above those present for the majority of the Holocene, peaking at 0.7 mm/yr. In contrast, organic material began accumulating at around 14,400 cal y BP in these depositional environments, earlier than the 11,700 cal BP increase in sedimentation rates. Before this time all sites exhibited relatively low rates of highly minerogenic sedimentation. After ~14,400 cal y BP the organic content of the sites gradually increased in a trajectory that continued throughout the Holocene, albeit with some major excursions from this trend. As an example, organic content peaked between about 7,500 and 6,000 cal y BP, only to fall to a low at about 5,400 cal y BP, which is then followed by a rapid increase to another peak between about 4,500 and 4,000 cal y BP. This last peak in organic content achieves similar values to the surface/modern samples. This peak (6.7ka)-trough (5.4ka)-peak (4.2ka)-trough (3.2ka) sequence suggests considerable variation in the controls of organic matter production and accumulation, which are mostly climatic parameters. The palaeoenvironmental implications of these results are currently being written for submission to a scientific journal. Goochs Crater in the Upper Blue Mountains. This site appears to have formed after a rock fall dammed the upper reaches of a relatively narrow valley/canyon. The site is presently a freshwater reed swamp with semi-permanent surface water, although the site has both flooded and burnt since first we first visited. After investigating the stratigraphy and depth of the accumulating sediments, three cores have been collected (G1,G2 & G3) along a transect from the edge to the centre. G1 is a 455 cm long core sampled close to the current waters edge: radiocarbon dating indicates that this represents from the present day back to about 9,500 cal y BP. This core is mostly organic-rich (>60% loss-on-ignition) but these authochthonous sediments are interspersed with abrupt (allochthonous) layers of sand and charcoal, probably transported to this location after major fire events. Our G2 core is 985 cm long and spans the period from about 4,000 to 17,500 cal y BP: it is also highly organic (20-95% loss-on-ignition) but does not include sand/charcoal layers. Core G3 extended down to highly minerogenic sediments at a depth of 795 cm and has a very similar stratigraphy to core G2. Queens Swamp near Lawson in the Blue Mountains. Queens Swamp was (re-)cored to a depth of 3.8 m and the sediment profile revealed alternating layers of sandy and peaty sediments similar to the edge core (G1) from Goochs Crater. Radiocarbon dating of the Queens Swamp cores suggests a rapidly accumulating upper section of sediments overlying a much older basal layer. Hanging Rocks Swamp located in Penrose State Forest in the Southern Highlands. A 5.6 m sediment core was also obtained Hanging Rock Swamp and these sediments returned a basal date of 14,500 cal y BP. 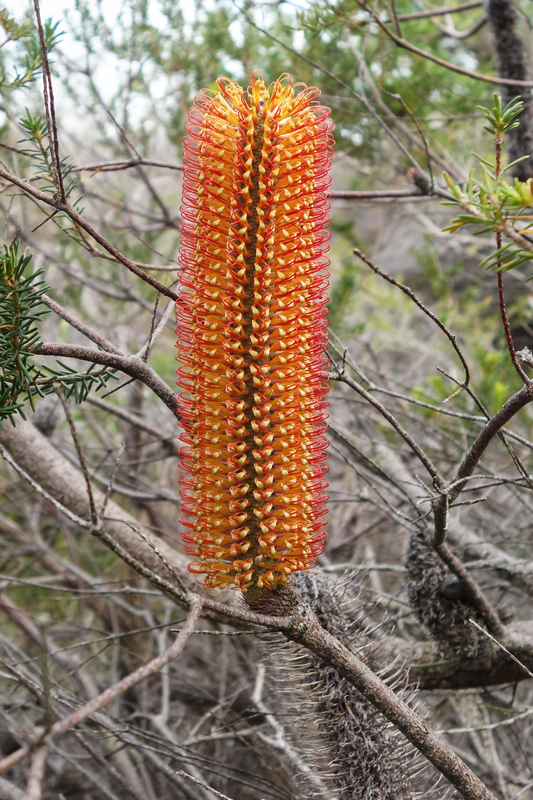 Field observations and preliminary results from fieldwork have been published in Quaternary Australasia and Australian Plant Conservation. Radiocarbon Dating of Sediments. Our THPSS research has involved 35 new radiocarbon (14C) analyses so far across the three sites (Goochs, Queens, Hanging Rock) mentioned above, with a few more planned soon. Twenty of these dates resulted from two AINSE grants, which allowed accelerator mass spectrometry (AMS) 14C dates. This dating was undertaken to develop robust chronologies of the sediments so that palaeoenvironmental changes could be well constrained, but we also undertook some experimentation to consider the optimum sediment fraction for future 14C dating. The sediment fractions considered were charcoal, pollen and short-lived plant macrofossils that were all isolated from the same depth in the sediment profiles. Preliminary results, in preparation for submission at the moment, suggest that charcoal has an inbuilt age of 60-500 years and plant macrofossils return an age closest to the true (modeled) age of that depth. Preliminary Palaeoenvironmental Interpretation and Conclusions. A variety of palaeoenvironmental techniques have been applied to the sediments sampled from Goochs Crater and together they provide information about past environmental conditions. As an example, sediment humification, which provides clues to surface moisture conditions at the time of deposition, suggests that the period from 9,500 to 7,500 cal y BP was relatively dry, which contrasts with previous palaeoclimatic inferences for this region. As different photosynthetic and metabolic pathways mean that the ratio of carbon/nitrogen can distinguish between aquatic and terrestrial sources of organic matter we analysed this ratio in 32 samples across the G2 core from Goochs Crater. These results suggests that aquatic sources of organic material dominated from 17,500 to 15,000 cal y BP and between 15,000 to 10,000 cal y BP conditions favored both aquatic and terrestrial sources. A rapid departure to highly terrestrial sources was evident at 10,000 cal y BP, after which a gradual change towards contemporary conditions, with a small aquatic influence, was evident. While this demonstrates that much of the (contemporary) accumulating sediments at Goochs Crater are derived from within the site, it also receives inorganic aeolian materials from a larger source area. To investigate this component we quantified the grainsize along the sediment profile to reveal that although clay content remains near constant (~ 5%) for the entire period, sand-sized particles shows a distinct increase in the period between 10,000 and 7,000 cal y BP before disappearing from the record. X-ray fluorescence scanning was also conducted on the G2 core resulting in elemental profiles for 32 elements at a very high (1mm) resolution. While the geochemical investigation of peat and organic sediments is in its infancy, several elements show considerable promise as palaeoenvironmental proxies. In our record, titanium, probably resulting from freshly weathered materials and washed in during periods of high surface runoff, is variable between 17,500 and 12,000 cal y BP, followed by sustained low values throughout the Holocene except for an abrupt, brief increase at 10,000 cal y BP followed again by high levels from 9,500 to 8,500 cal y BP. Bromine, which indicates the deposition of marine aerosols, shows an opposite trend to titanium, with low values until the early Holocene when a gradual increase begins, most likely indicating increased maritime influence on the hydrology of the site as sea level rose and stabilized in the post-glacial period. In summary, it appears that Goochs Crater began accumulating organic sediments around 17,500 cal y BP, shortly after which a small, shallow lake developed and persisted in an otherwise sparsely vegetated landscape. The establishment of shoreline vegetation by about 15,000 years ago contributed to the accumulating sediments and this seems to have occurred under a climate of strong but variable westerly winds. A gradual but increasing oceanic influence affected the site until 10,000 cal. BP. before abrupt drying occurred. Increased sand present in the record during the early Holocene and other information suggests a relatively dry period. During the rest of the Holocene, the site returned to a wet, swampy environment: we are currently re-analysing the edge core with a broader suite of proxies to better characterize the late Holocene and it is envisaged that this will result in a complete moisture-focused palaeoenvironmental record from the site from 17,500 cal. BP to present. In the rest of this project (it will run until the end of 2016) we will finalize the interpretation of the other sites and the synthesis will provide a regional picture of palaeoclimatic influences on these important ecological communities. This work will also be compared to high-resolution fire histories that are being developed across the region. Stakeholders, Funding and Acknowledgements. This research was funded through the Temperate Highland Peat Swamps on Sandstone Research Program (THPSS Research Program). This Program was funded through an enforceable undertaking as per section 486A of the Environment Protection and Biodiversity Conservation Act 1999 between the Minister for the Environment, Springvale Coal Pty Ltd and Centennial Angus Place Pty Ltd. Further information on the enforceable undertaking and the terms of the THPSS Research Program can be found at www.environment.gov.au/news/2011/10/21/centennial-coal-fund-145-million-research-program. This work has benefited from discussion with Martin Krogh, Doug Benson, Sarsha Gorissen, Geoff Hope, Roger Good and Jennie Whinam. This work has also been supported by a 2014 and 2015 AINSE Research Award (ALNGRA14019 and 15019) to SM. Contact information. The project ‘Palaeoenvironments of sandstone peat’ is being undertaken by A/Prof Scott Mooney (School of Biological, Earth and Environmental Science (BEES) UNSW +61 2 9385 8063, s.mooney@unsw.edu.au), Professor James Goff (School of BEES UNSW j.gof@unsw.edu.au) and Mr Len Martin (PhD candidate, School of BEES, UNSW, +61 2 9385 8063, lennard@student.unsw.edu.au). Introduction. 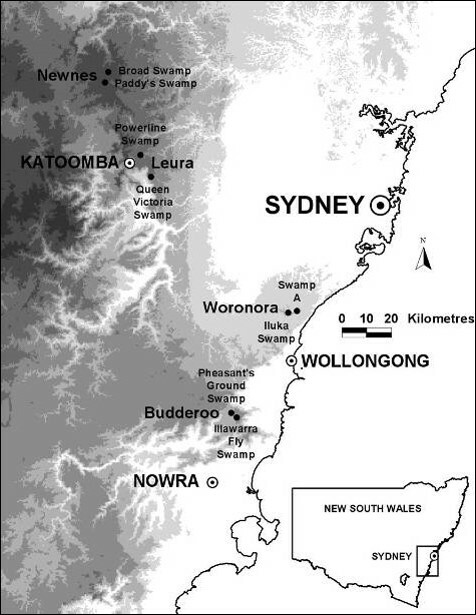 Little is known about the historical or present-day connectivity of Temperate Highland Peat Swamps on Sandstone (THPSS) in the Sydney Basin (NSW). Recent technological advances have enabled exploration of genetic complexity at both species and community levels. By focusing on multiple plant species and populations, and investigating intraspecific gene-flow across multiple swamps, we can begin to make generalisations about how species and communities respond to change, thereby providing a solid scientific basis from which appropriate conservation and restoration strategies can be developed. 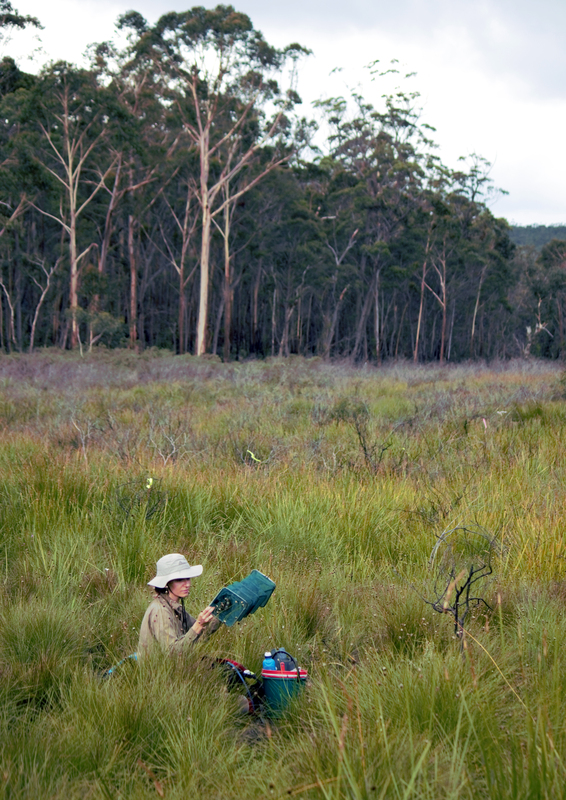 The study area comprised eight swamps distributed across four sites along an altitudinal gradient: Newnes (1200m); Leura (900m); Budderoo (600m); and Woronora (400m), see figure 1. 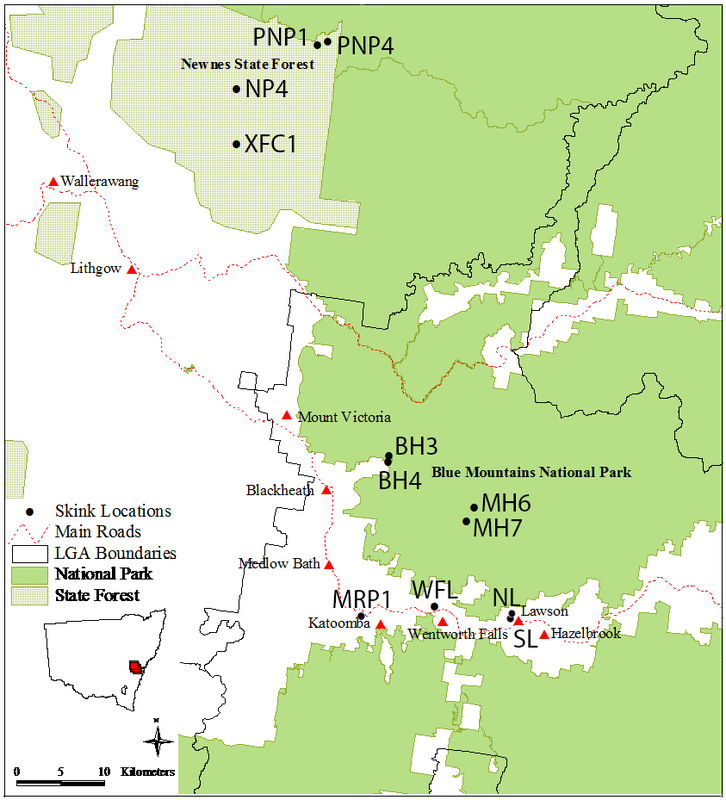 Map of the Sydney Basin region showing four study sites and eight swamps. Greyscale shows altitude gradient. To assess the relative genomic diversity among target species representing a range of life-history traits. This was achieved by sequencing chloroplast DNA and detecting variants in pooled samples from 25 species commonly occurring in swamps. To explore geographic patterns of diversity among swamps and across multiple species by designing targeted genomic markers and screening variants among populations within and between sites (for ten species occurring in up to 8 swamps). To develop a set of simple, effective and standardised tools for assessing diversity, connectivity and resilience of swamps to threats (from mining to climate change). We have taken advantage of new available methods and technologies (McPherson et al. 2013 and The Organelle Assembler at http://pythonhosted.org/ORG.asm/) to sequence and assemble full chloroplast genomes of 20 plant species from swamps in the Sydney Basin and detect within and between-population variation. This enabled a rapid assessment of diversity among representatives of 12 families and a broad range of life-history traits – e.g. table 1. We are currently finalising our bioinformatic sampling of the data to ensure even coverage of chloroplast data across the species, however these preliminary data show that relative estimates are not a product of different amounts of chloroplast data retrieved (e.g. for the seven species with sequence length greater than 100,000 base pairs variation ranges from absent to high). 2. 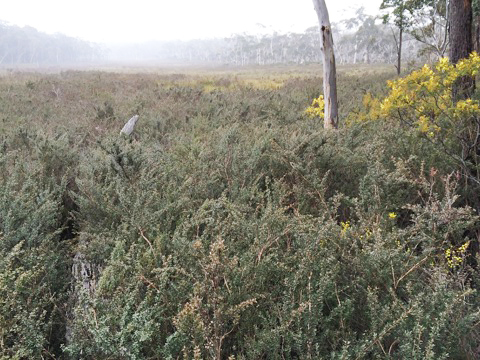 Swamp-level assessment of variation and connectivity using three target species – Baeckea linifolia (high diversity), Lepidosperma limicola (low diversity) and Boronia deanei subsp. deanei (restricted and threatened species). From the initial species-level study we selected three very different species for detailed population-level studies. We designed markers to screen for variation within and among sites and explore landscape-level connectivity. We identified the Woronora Plateau as a possible refugium and we have uncovered interesting patterns of gene-flow on the Newnes Plateau. Two species, Lepidosperma limicola and Baeckea linifolia seem able to disperse over long distances while Boronia deanei subsp. deanei showed unexpected high levels of diversity despite very limited seed-mediated gene-flow between populations. Its current conservation status was supported by our findings. A unique pattern was found for each species, highlighting the need for a multispecies approach for understanding dynamics of this system in order to make informed decisions about, and plans for, conservation management. Since the population study approach proved successful we expanded our study to include population studies for a further ten species. This required development of new Next Generation Sequencing (NGS) approaches applicable to a wide range of study systems. This kind of approach will allow us to make informed generalisations about swamp communities for conservation management planning. Table 1. Preliminary results showing relative chloroplast variation among 25 swamp species. 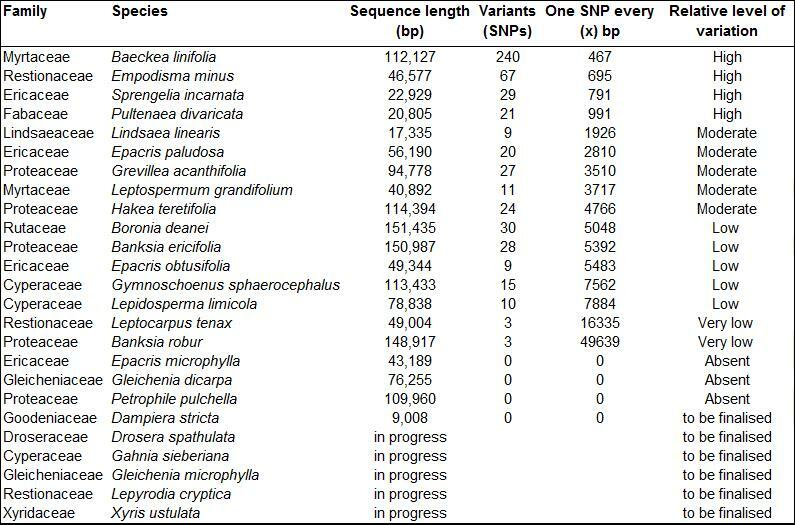 Sequence length is in base pairs (bp) and relative level of variation was calculated as sequence length divided by number of variants to obtain an estimate of number of SNPs per base pair. Relative variation was then categorised as: High (one SNP every <1,000 bp); Moderate (one SNP every 1,000 – <5,000 bp); Low (one SNP every 5,000 – <10,000 bp); Very low (one SNP every >10,000 bp); or absent (no SNPs). Results to date. We have assembled partial chloroplast genomes of 20 plant species from THPSS in the Sydney Basin and categorised relative measurements of diversity. Preliminary data from the three target species highlighted the need for multispecies studies and we are now finalizing our results from an expanded study (including 13 species) in order to better understand connectivity and resilience of THPSS and provide data critical for more informed conservation planning. We have produced unique, simple methods for assessing genetic diversity and understanding dynamics at both the species and site levels. Lessons learned and future directions. We found that individual species have unique patterns of genetic variation that do not necessarily correspond with phylogeny or functional traits and thereby highlight the benefit of multispecies studies. We have developed a unique, simple method for screening for genetic variation across whole assemblages which can be applied to many study systems. Since our data capture and analysis methods are standardised it will be possible in the future to scale this work up to include more species and/or more geographic areas and analyse the datasets together to address increasingly complex research questions about the resilience of swamps in a changing landscape. Stakeholders and Funding bodies. 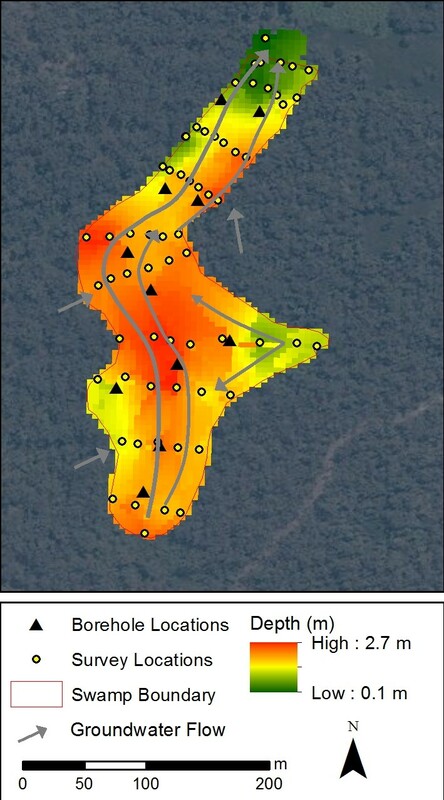 The following people have contributed to many aspects of this research, including design, fieldwork and data generation and analysis: Doug Benson and Joel Cohen (Royal Botanic Gardens and Domain Trust), Anthea Brescianini and Glenda Wardle (University of Sydney), David Keith (Office of Environment and Heritage). This research was funded through the Temperate Highland Peat Swamps on Sandstone Research Program (THPSS Research Program). This Program was funded through an enforceable undertaking as per section 486A of the Environment Protection and Biodiversity Conservation Act 1999 between the Minister for the Environment, Springvale Coal Pty Ltd and Centennial Angus Place Pty Ltd. Further information on the enforceable undertaking and the terms of the THPSS Research Program can be found at www.environment.gov.au/news/2011/10/21/centennial-coal-fund-145-million-research-program. Introduction. The Temperate Highland Peat Swamps on Sandstone (THPSS) ecological community consists of both temporary and permanent swamps developed in peat overlying Triassic Sandstone formations at high elevations, generally between 400 and 1200 m above sea level on the south-east coast of Australia. THPSS are listed as an endangered ecological community (EEC), threatened by habitat destruction and modification of groundwater and hydrology. The primary impact of longwall mining is to swamp hydrology, influencing long-term surface and groundwater regimes. This, in turn, can have a devastating impact on swamp ecology including many important habitats for protected flora and fauna. While the ecological value of THPSS is well understood, our current understanding of the hydrology of THPSS is limited. THPSS have been found to be dependent on groundwater, and subsequently the impact of modifying groundwater interactions can be significant. Recent research has concluded that a thorough understanding of the impact of longwall mining on the surface waterways and groundwater system is necessary before any remediation options to reduce loss of water into subsurface routes and minimise impact on water quality are considered. Aims. To address this major knowledge gap, research into the fundamental hydrology of THPSS was undertaken. The purpose of this investigation was to understand the role of surface water and groundwater inputs and losses in maintaining swamp hydrology, providing a base level foundation from which the impacts of long-wall mining on ecology can be determined and guide future remediation efforts. To undertake on-ground research, multiple locations where data collection in peat swamps was being undertaken were utilised to form a foundation from which to expand swamp investigations and target site data gaps. Two swamps were selected for further detailed investigations, both located on the Woronora Plateau, approximately 80km south of Sydney, Australia. One site was within the Woronora Nature Reserve, where vegetation has been monitored regularly for 30+ years and basic climate monitoring for the past 5 years, and another swamp within the Sydney Metropolitan Catchment Management Area where climate monitoring, groundwater levels and swamp discharge has been monitored for the previous 5 years. Extensive on-ground investigations were undertaken (and continue to be monitored) at these sites, providing fundamental scientific information for further assessment. Methods. A series of groundbreaking on-ground investigations were undertaken to characterize the swamp hydrogeology and surface hydrology. Detailed surveys of peat depth were initially undertaken using a push rod and RTK-GPS to determine digital elevation models (DEM) of surface topography and subsurface sandstone. Depth to underlying sandstone was found to be variable throughout the swamps (Figure 1). This survey guided the location and density of soil profiles and piezometer installations to characterize sediment characteristics, monitor water level fluctuations and assess water and soil chemistry. A total of 17 piezometers were installed to bed rock, including logging soil stratigraphy and soil grab samples. Slotted 50mm diameter PVC was installed with a water level logger deployed near the bedrock. Soil samples were analysed for pH, EC, moisture, organic matter and a suite of analytes via ion chromatography. Hydraulic conductivity of the upper peat layer was also tested in-situ. Collected field data and site characterization surveys were combined to construct a three-dimensional numerical hydrological groundwater model to assist in determining the swamp water balance, hydrodynamics and to refine future sampling/analysis. Findings. Findings include fundamental swamp hydrogeolgical characteristics, water balance summaries and analysis of degrees of freedom. Swamp sediments were observed to vary both within swamps and between swamps. Sediment depths were found to range between 0.5 m to 2.6 m deep, with typical peat depths ranging between 30 cm – 100 cm of a dense organic layer in various stages of decomposition. 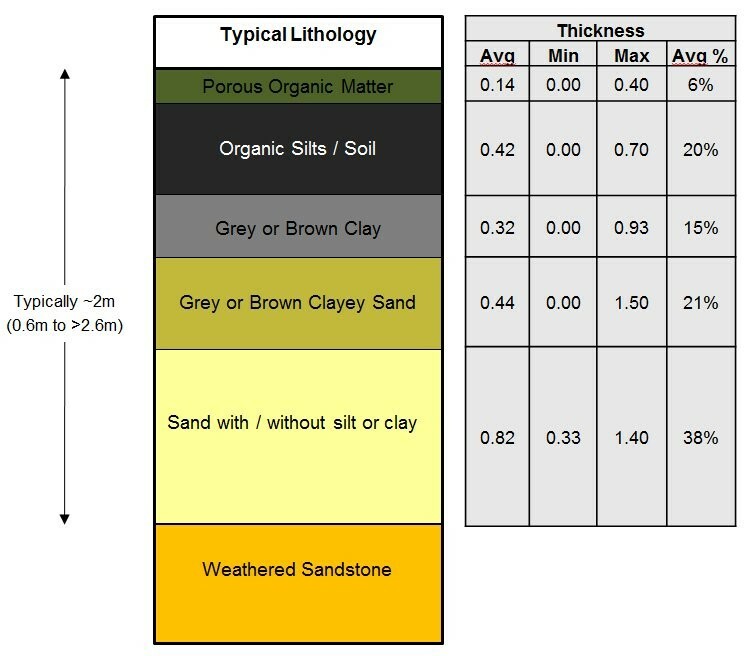 The organic layer is underlain by grey sandy clay with clay content decreasing with depth (Figure 2). Sand and gravel was observed in the 10 cm to 30 cm range above bedrock. Soil acidity was observed to be relatively uniform over depth with an average pH 5.7, however electrical conductivity and chloride decreased with depth; suggesting evapo-concentration of salts within the upper layers of the swamp. Soil moisture by weight and organic content were measured to decrease with depth, indicating decreasing porosity. Specific yield of swamp surface soils (0 m to 0.2 m) ranged between 15-20%, with deeper sediments (0.2 m to 0.4 m) approximately 10% greater. Analysis of the water levels across the swamps, in conjunction with preliminary water balance modelling, indicates that despite the current data collection program, significant degrees of freedom remain unaccounted. Key factors such as transpiration, runoff, infiltration, interflow and groundwater losses are currently unknown and present seven sources of uncertainty within the water balance model. To reduce the uncertainty and close the water balance of peat swamps, further long term monitoring and site specific measurements are required. With the addition of soil core samples, soil hydraulic conductivity, long term water level data and further swamp geometry data, eight out of a total of nine water balance quantities will be known for the swamp, enabling increased reliability to assess the impacts of climate change, changes in land use, and undermining on long-term swamp ecology. The findings from this study provide fundamental information that forms the basis for ongoing investigations critical for understanding peat swamp hydrology. Acknowledgements. This research was funded through the Temperate Highland Peat Swamps on Sandstone Research Program (THPSS Research Program). This Program was funded through an enforceable undertaking as per section 486A of the Environment Protection and Biodiversity Conservation Act 1999 between the Minister for the Environment, Springvale Coal Pty Ltd and Centennial Angus Place Pty Ltd. Further information on the enforceable undertaking and the terms of the THPSS Research Program can be found at www.environment.gov.au/news/2011/10/21/centennial-coal-fund-145-million-research-program. Contact. William C Glamore and Duncan S Rayner, Water Research Laboratory, School of Civil and Environmental Engineering, UNSW Australia (110 King St, Manly Vale, NSW 2093, Australia, Tel: +61/ 2 8071 9868. Email: w.glamore@wrl.unsw.edu.au ). 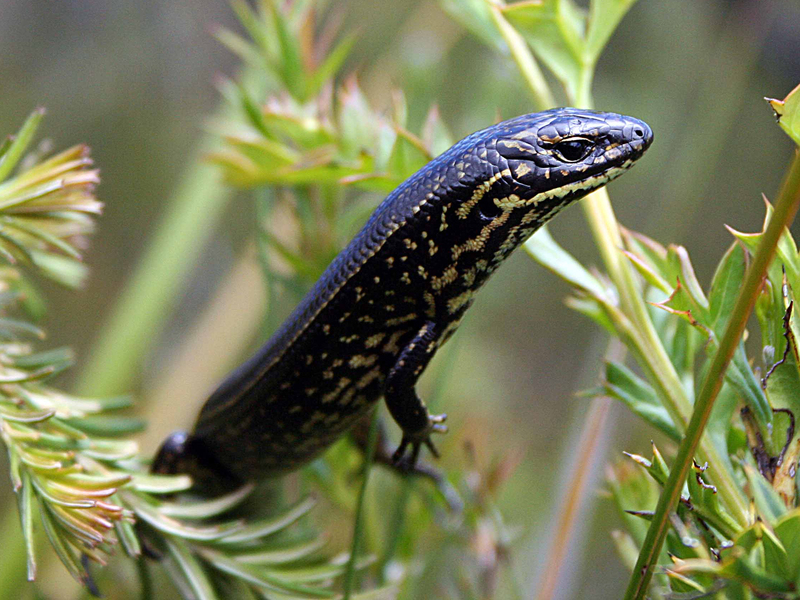 The Blue Mountains Water Skink is known from less than 60 isolated swamps in the Blue Mountains and Newnes Plateau of southeastern Australia (Fig 1). Understanding the species’ ecology, notably its vulnerability to threatening processes such as fire and hydrological disturbance, is essential if we are to retain viable populations of this endangered reptile. Design: We surveyed swamps across the species’ known range to identify critical habitat requirements, and to examine responses both of habitat features (vegetation) and lizard populations to fire regimes and other anthropogenic disturbances. Our analyses of fire impacts included both detailed studies post-fire, and GIS-based analyses of correlations between lizard abundance and fire history. Results to date: Blue Mountains Water Skinks appear to persist wherever suitable swamp habitat is maintained, although lizard numbers decline after frequent fires, hydrological disturbance or urbanization. However, the lizards (especially, adults) rarely venture out from the core swamp habitat into the surrounding woodland matrix. The “fast” life-history of this species (rapid growth, early maturation, high reproductive output) enables populations to recover from local disturbances, but very low vagility means that re-colonisation of a swamp after extirpation of a population is likely to be very slow (if it occurs at all). Lessons learned and future directions: The suitability of a montane swamp for Blue Mountains Water Skinks can be readily assessed from soil-moisture levels and vegetation characteristics. Effective conservation of this endangered reptile species should focus on conserving habitat quality in swamps, rather than targeting the lizards themselves. If healthy swamps can be maintained, the lizards are unlikely to face extinction. Given high levels of genetic divergence among lizard populations (even from adjacent swamps), we need to maintain as many swamps as possible. Stakeholders and Funding bodies: This research was funded through the Temperate Highland Peat Swamps on Sandstone Research Program (THPSS Research Program). This Program was funded through an enforceable undertaking as per section 486A of the Environment Protection and Biodiversity Conservation Act 1999 between the Minister for the Environment, Springvale Coal Pty Ltd and Centennial Angus Place Pty Ltd. Further information on the enforceable undertaking and the terms of the THPSS Research Program can be found at www.environment.gov.au/news/2011/10/21/centennial-coal-fund-145-million-research-program.